30 years in the making, BENZGEM Luxury Brand... the World's Best, Believable and Convincing Alternative to Diamond has Arrived! • 99% of imitations are made of inexpensive commercial grade, Colorless Rough that are poorly cut. Other than being colorless, and fiery, like crystal, these imitations always look costume, very much unlike a Real Diamond. Cut plays the deciding role in determining whether a newly faceted Diamond will be a beautiful, handsome, Work of Art. • The "Life" seen within a Diamond, as the diamond moves ever so slightly, is the result of careful engineering, proper proportions and Excellent Cutting. In fact Rough Diamond of mediocre color and clarity normally viewed as undesirable, become palatable once an Excellent Cut is applied. • Proper Proportioning, a Fine Make [The Act of creating the Symmetrical Outline of a Diamond, i.e. Pear Shape, Marquise Shape, etc.] and Excellent Cut, all work to bring about the Fabulous effects we desire most in Diamonds; Flashes of White light, Sparkle, Scintillation, and Fiery Brilliance. • And Finally, None of the previously mentioned Affects are possible without Faceting Style. Diamond Faceting Patterns for any given shape are Tried and True. These are the Standard by which any white Transparent Stone should be Held. 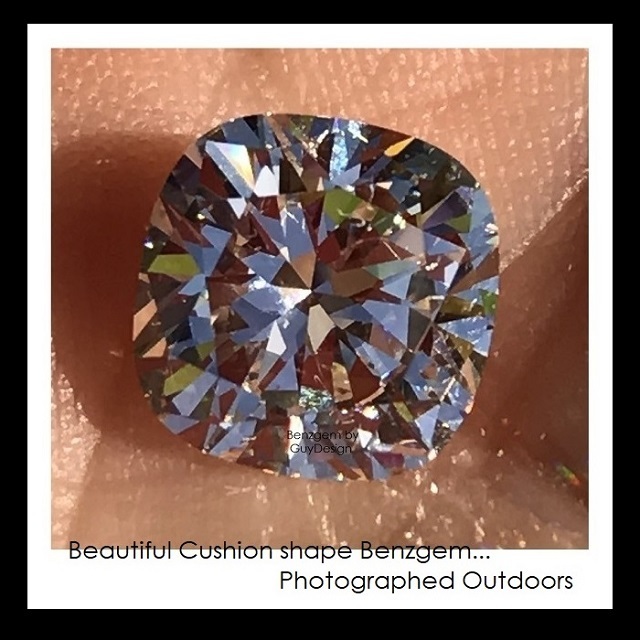 Unlike all the others, Benzgem is singly refractive Like a Diamond, G-H-I-J Color like a Diamond, and possess other Qualities like a Diamond, we are the ONLY Company providing a Luxury Diamond Quality Cut. because Benzgem it is the Best, Benzgem Solitaires are always set with a Genuine, Mined from the Ground Diamond semi-mount. • Because of Benzgem's Diamond qualities, Benzgem is always set in Real Jewelry settings designed for Real diamonds. Benzgem is not costume, it is serious Jewelry, it is Bespoke. The Benzgem semi-mount is always set with your choice of Genuine Precision Cut, G-H Color, VS Clarity Diamonds or Genuine Hearts & Arrows, F+ Color, VS Clarity Diamonds. Benzgem was created Exclusively by GuyDesign® for the sole purpose of being the Most Believable and Realistic Alternative to a Mined Diamond..
Like all Genuine Natural Diamonds, each Benzgem is Singly Refractive, and therefore, Sparkle like a diamond. Benzgem's luster, like diamond, is Adamantine. Benzgem is strong, it is harder than hardened steel. • Each Jewel is handled in the same fashion as its Genuine Counterpart resulting in an eminently credible Benzgem; Designed, Hand Cut, and Polished as Real Diamonds are. • Because of its Color and Genuine Diamond qualities, Benzgem will Match and Coordinate with the Genuine Diamonds you already own. • No other Imitation can compare to Benzgem. Benzgem is better than Moissanite, White Sapphire, White Topaz, or any Commercial or coated CZ. None can compare to the Beauty of Benzgem or have the advantages and Benefits a Benzgem provides. Photo of a Very Large 5 carat Round Moissanite. Notice the Overall Blurred appearance of this stone. This is Double Refraction in action. Diamonds and Benzgem are both Singly Refractive. 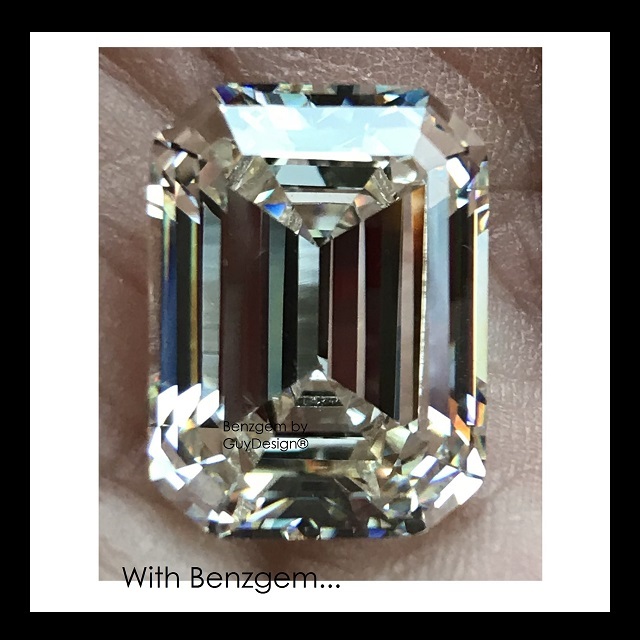 Innovative, Exquisite, and Exclusive, Benzgem is THE closest to any Genuine Mined Diamond available on the market... Guaranteed! Current Market, first tier Retail Prices for Genuine, Mined Diamonds. **All Certified diamonds from a reputed Lab, Same Cut, Color and Clarity. Certificates and Appraisals are not a Guarantee of Value. Jewelry appraisals are based on the prevailing First Tier retail price one could currently expect to pay for the item being appraised. Diamond Certificates from a reputable Gem Lab are usually a listing of the important features and measurements of the respective diamond only. Appraisals & Certificates are not a Monetary Value Guarantee.